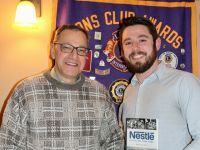 The Fulton Lions Club has announced that they will be hosting their 6th annual Mane Event comedy night with nationally known comedians Chris Coccia, the headliner, and opener, Chip Chantry. on Friday, Oct. 12, at the Fulton Polish Home. All proceeds raised will benefit community members in need. Presale tickets are $15 and can be purchased up to Oct. 5 at Devine Designs, Fulton Medicine Place, Phoenix Medicine Place, Mimi’s Drive-In, PathFinder Bank-Fulton, and the Fulton Polish Home. Ticket donations sold at the door can be purchased for $20 per person and “Laugh Package” tables of eight may also be purchased in advance for $200 per table. “Laugh with the Lions-Laugh Package” includes reserved preferred seating near the stage, waitress service, specialty pizzas, snacks and soda, and one complimentary drink per person. Laugh Package tables can also be purchased online at fultonlionsclub.com. For more information contact Deana Michaels, event co-chair, at (315) 529-5508, or co-chair Linda Hughes at (315) 960-3019. According to his website, (chriscoccia.com), he has appeared on Comedy Central, The Game Show Network and XM Radio. “Chris Coccia’s act is a perfect combination of hilarious material sand the ability to present it ‘in the moment’. Flowing seamlessly between material and improvised interaction with the crowd, Chris is able to open the audience up as he pulls them into a shared recognition of our own human-ness. Chip Chantry is a television writer and stand-up comedian. According to his website, (chipchantry.com): “He has written for the first season of ‘Crazy Talk,’ a comedy/talk series for NBC Universal and the syndicated series ‘Whacked Out Sports.’ He was the winner of 2013’s Philly’s Phunniest Contest at Helium Comedy Club, where he is a regular performer. Chip also won the ‘Funniest Comedian’ award in Philadelphia’s annual Comedy Awards in both 2012 and 2014. The Fulton Lions Club helps the community with a variety of projects and services by their annual fundraising events such as the Lions Loot Sweepstakes and Charby’s Duck Derby. For further information visit their website, https://fultonlionsclub.com.